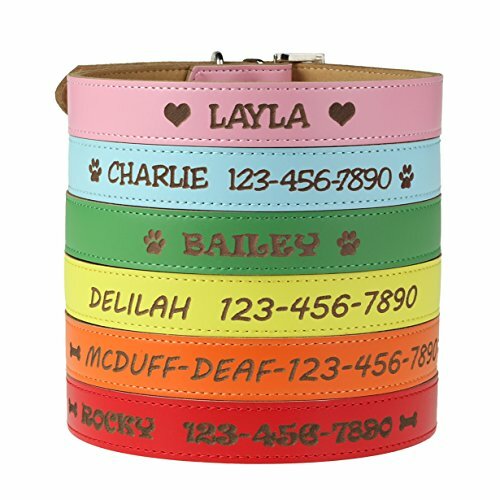 Soft pink, blue, green, orange, yellow or red leather with different text styles to choose from. 1 inch wide for M or L size. 3/4 inch collar width for small size. 1/2 inch width collar for extra small size. Personalized dog collars are perfect as a service dog collar, a dog wedding collar or any other use you can imagine! Made of genuine leather, engraved in Vermont. A truly high quality customized pet id alternative. These custom dog collars replace pet tags and cheap embroidered collars. Customizable with your phone number and your puppy or dog’s name, or anything you want! The most durable, heavy duty variation on dog id tags. The best dog collar when it comes to keeping your dog safe. Comes in large, medium, small or xs collar sizes. Custom pet collars make your dog stand out from the rest. Metal id dog tags are noisy and become lost or become unreadable while a dog collar with name engraved is permanently readable. 100% guaranteed quality. We are absolutely sure you will love this collar.